Essential Oils For Sale – Why We Love Essential Oils & How to Save! Have you been hearing more & more about essential oils & wondering what they are all about & the different ways to use them? I had heard about essential oils for awhile and finally had the chance to try them when a blogger friend of mine shared some samples with me about a year and a half ago. I am now totally hooked on using therapeutic-grade Essential Oils with my family for more than a year and a half – and not only am I hooked, but my husband and girls are too, as they have seen the effects first-hand, time and time again with better overall health & wellness in our home. Sia & her family also started using essential oils about 6 months ago & they are loving all the ways they can use them in their home, too! We decided to share our love of essential oils with all of you readers as it’s something that has changed our lives so much and you might also be looking for more natural ways of dealing with wellness in your family, natural & effective cleaning methods, chemical free beauty regimes and more. We know that there are different companies & brands that people like, but we just wanted to share the Essential Oils that we use & why we chose them. For many of you, you may have already used essential oils for aromatherapy or other ways, as they are found in so many retail & health food stores now. However, if you read the labels carefully, they will say things like “Do not take internally” or “Do not apply directly to your skin”. Essential oil companies can claim to be “Pure Essential Oil” but that claim can legally be made if there is as little as just 5% of the actual essential oil from the plant in the bottle. There is also no regulation for how an essential oil is to be extracted from the plant. Companies are free to use high-heat, high-pressure, and chemical-solvents to extract more from the plants, and still use whatever label they want to on the oil. In fact, the majority of essential oil companies buy their oils from an oil broker. The company isn’t actually involved in the process of cultivating the plants or extracting the oils at all. So, all this to say, that it is really important to do your research & find out exactly what is in the essential oils you are using & find out the process they have used to extract, distill & bottle the oils. I will tell you that when you look for pure, therapeutic grade oils, they will definitely be more expensive than what you can find in the health food stores or other places, but for us, we know that we are paying for that higher quality in the whole process of creating the oils. We are a frugal family so it was hard at first to think about spending money on the oils until we realized that we had fewer & fewer expenses this last year and a half by investing in better wellness for our family & using oils for so many separate products we would normally buy. And those little bottles of pure essential oils are so powerful so you use very little at a time, which makes them last so much longer than you’d think. Wide variety – Young Living has the largest variety of pure, therapeutic grade oils and products – after realizing how much I loved oils & all the ways they could be used around our home and to better our overall wellness in our family, I found the best selection of oils & products from Young Living. Seed to Seal Promise – This is a 5 step process that Young Living goes through for every one of their essential oils & products. From the time the seed is sourced until the oil is sealed in the bottle, they use strict quality controls to ensure that you are receiving essential oils exactly the way nature intended. They can guarantee that absolutely no pesticides or herbicides were used growing the oils. They even do the weeding by hand on their farms & use essential oils for pest control. 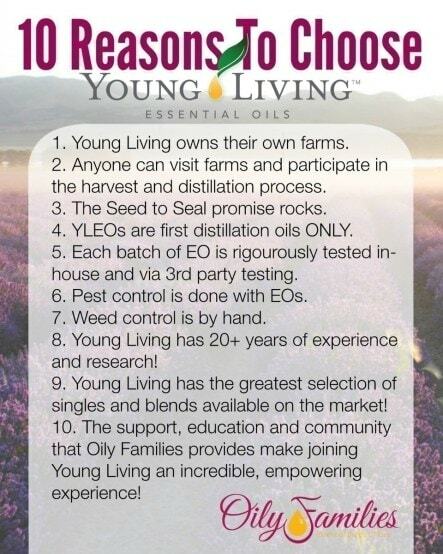 Length of Time that Young Living has been in business – after doing all my research, I really liked the fact that Young Living has been in business developing & selling essential oils for 20+ years. And every year it becomes more and more popular, so that says a lot to me about their reputation & consistency as a company. There are so many ways to use essential oils and we keep learning the more we use them. Check out our DIY Essential Oil recipes & the ways we use them! Essential oils have changed our lives for the better with overall wellness for our families & eliminating unwanted chemicals from our home and they are something that we use every day in our home. We use them in every way from boosting our immune system to helping our bodies have better respiratory & digestive support, healthier skin thru these natural beauty regimens & more! 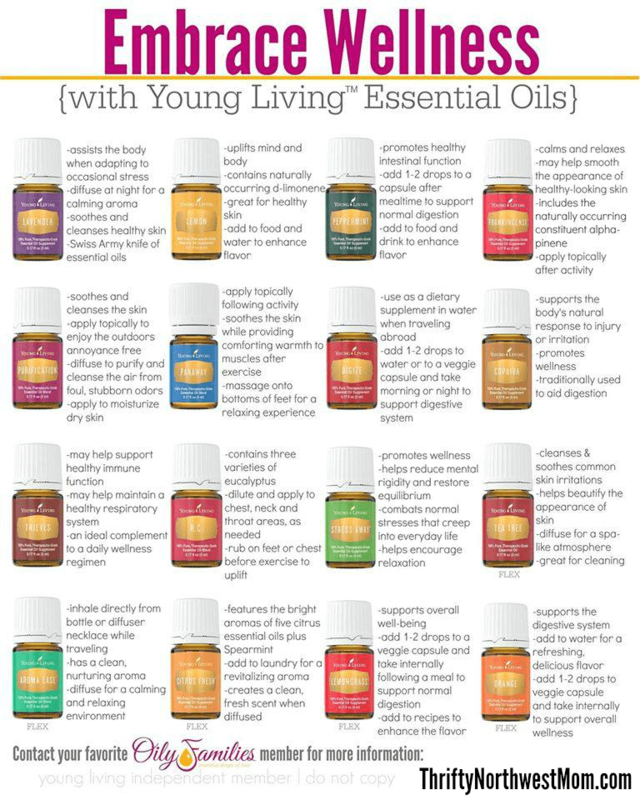 There are several options you have if you choose to buy Young Living Essential Oils. You can buy them directly through the website as a retail customer. You will need to head to YoungLiving.com and make an account as a “Customer”, so you can access the website. Then you can purchase specific oils that you are interested in. If you’d like to save 24% off your essential oils every time you order, you will want to consider the “Wholesale Member” (or Distributor) option. You will get 24% off each time you order and all you have to do to keep this Wholesale Membership is to spend a minimum of 50 point value (this is around $50) every year. There is no obligation to sell anything at all with the Wholesale Membership. If you want to start sharing with your friends & family, you can do that with a Wholesale Membership but there is no obligation whatsoever – you just get to take advantage of this way to save on your oils each time you order by buying a Premium Starter Kit. If you’ve read through this long email & decided you are ready to try out Young Living Essential Oils, I’d recommend starting with the Young Living Premium Starter Kit I show above. You will get 11 of the most popular, most frequently used oils, as well as a diffuser and additional samples for $160. If you purchased these items separately, it would cost over $300, so it’s an almost 50% off savings. 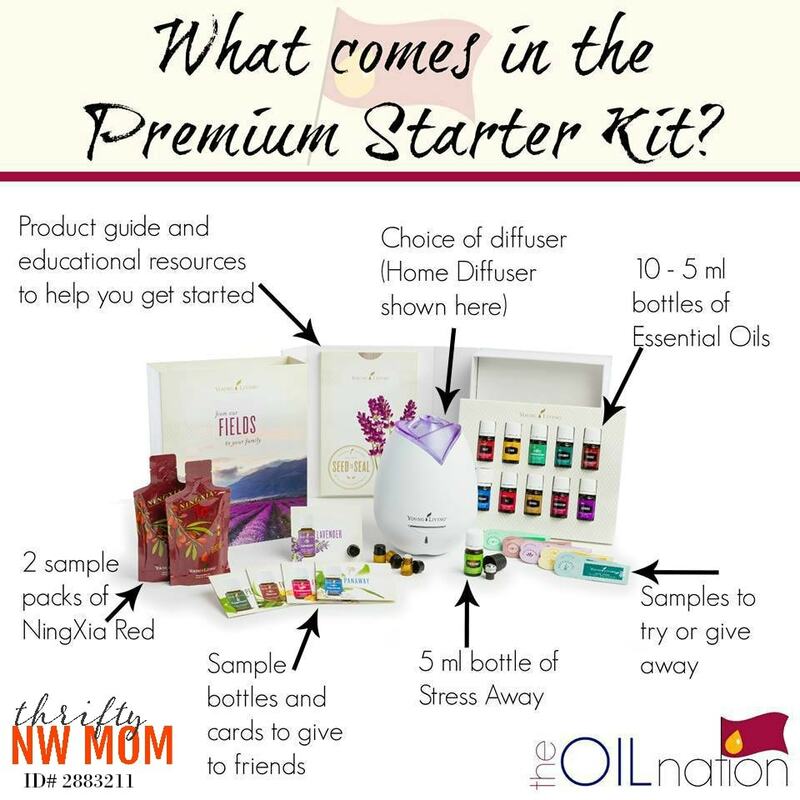 In order to get a wholesale membership, you just need to sign up for any starter kit, but the Premium Starter Kit is the best value and if you purchase that, we will send you some freebies to go along with it, so you can make sure you know how to use your oils! We really do feel that essential oils have changed our life for the better and we want anyone who buys them to understand how to use them, so when you purchase a Premium Starter Kit through Thrifty Northwest Mom using the instructions below, we will personally send you reference materials, a full set of bottle labels for the tops of your oils (they are labeled on the sides, but it’s nice to see the labels on the tops quickly, too) and a $20 Amazon Gift Card. This is so that you can purchase some extras such as sample/smaller bottles to keep with you & roller bottles to make your own blends or use your oils with a roller to make it easier to apply (I love to use a roller ball with my oils that I use daily). To get these freebies with your order, follow the steps below when you order. 5 ml bottle of R.C. The total retail value of this Premium Starter Kit is $300 but you can pay as low as $160, depending on the diffuser you choose. 6. If you already know that you want to be ordering regularly, then you can go ahead and sign up for Essential Rewards right there when you order your starter kit! It’s an awesome way to earn FREE oils with your order every month! It’s a completely OPTIONAL program, so if you’re just wanting the starter kit for now then you can just skip this part of the sign-up process. I’ll send over an email with more details on that part of things after you sign up. 7. Go through the checkout process. Young Living accepts most major credit cards, including Visa, MasterCard, Discover, and American Express. If you have any more questions about getting started with essential oils, please feel free to send us an email at [email protected], or in the comments below! Also, if you are an essential oil user, we’d love to hear which oils you use most often, and why! Purchase a Starter Kit and then you just need to spend a minimum of 50 point value (around $50 value) in products each year to keep your wholesale discount. It’s the best way to get significant discounts on your essential oils – 24% off every time you order. 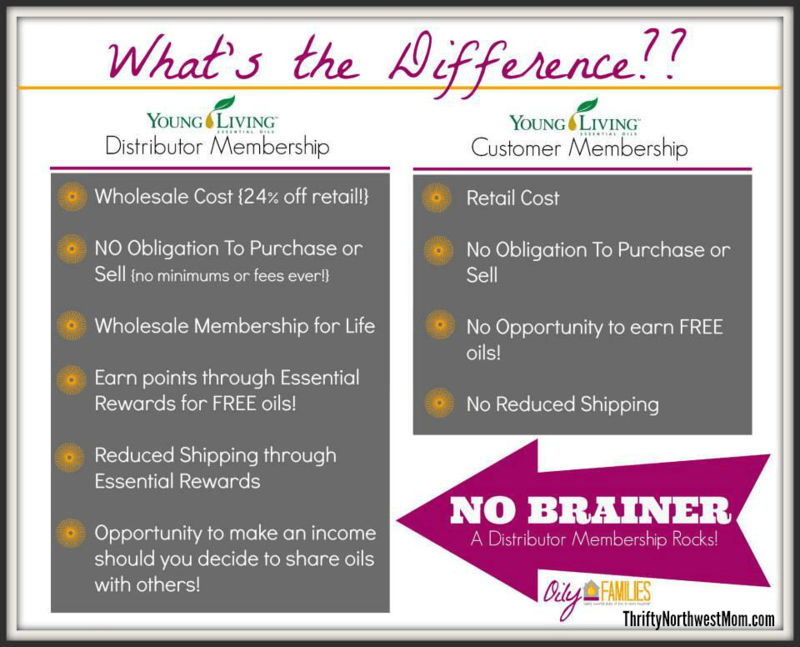 Do I have to sell Young Living Products to be a Wholesale member? I really just want to use the oils for myself. You do not have to ever sell anything in order to be a Wholesale member & get the wholesale pricing. You can just use the wholesale free membership to get your products at a discount. If at any time, though, you want to share with a friend or family member and they want to purchase, they can then make their purchase thru your referral link so you will get credit for them signing up. Is there a monthly purchase requirement to have a Wholesale Account? No, you just order what you need when you need it. The only requirement to keep your Wholesale account active is to place one 50PV (point value – about $50 in value) minimum order per year. If you miss doing that, you can easily reactivate your account by calling Young Living Customer Care and placing a 100 PV order. Are there any other ways to save money on the oils? Another way to save on essential oil purchases is to sign up for a program called Essential Rewards so that you can earn free oils. It will also give you reduced shipping & more. There will also be periodic sales on products & monthly promotions as well to save more. Once you’ve signed up for your Wholesale Young Living account (using steps above), let us know & we can tell you more about Essential Rewards. What kind of support do I get after joining Young Living through you? When you join as a Wholesale member through our site, you will get access to the private Oil Nation Facebook group. This community has thousands of members and it’s the perfect place to ask questions & find some great resources with more information.